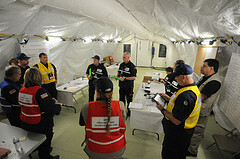 The National Incident Management System (NIMS) defines preparedness as “a continuous cycle of planning, organizing, training, equipping, exercising, evaluating, and taking corrective active in an effort to ensure effective coordination during incident response.” The cycle is one element of a broader system to prevent, respond to, recover from, and mitigate against natural disasters, acts of terrorism, and other man-made disasters. The National Response Framework presents the guiding principles that enable all response partners to prepare for and provide a unified national response to disasters and emergencies – from the smallest incident to the largest catastrophe. The Framework establishes a comprehensive, national, all-hazards approach to domestic incident response. Click here to learn more about how to plan for an emergency situation. Organizing and equipping provide the human and technical capital stock necessary to build capabilities and address modernization and sustainability requirements. Organizing and equipping include identifying what competencies and skill sets people should possess and ensuring an organization has the correct personnel. Additionally, it includes identifying and acquiring standard equipment an organization may need to use in times of emergency. System Assessment and Validation for Emergency Responders (SAVER) Program assists emergency responders in making procurement decisions. The SAVER Program conducts objective assessments and validations on commercial equipment and systems, and provides those results along with other relevant equipment information to the community in an operationally useful form. Citizen Corps Partners and Programs provide resources for public education, outreach, and training and offer volunteer service opportunities for citizens to support first responders, disaster relief activities, and community safety efforts. 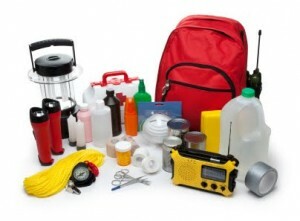 These resources include the Community Emergency Response Team Program, which educates people about disaster preparedness for hazards that may impact their area and trains them in basic disaster response skills, such as fire safety, light search and rescue, team organization, and disaster medical operations. The Emergency Management Assistance Compact (EMAC) is a national interstate mutual aid agreement that enables states to share resources during times of disaster. EMAC is administered by the National Emergency Management Agency (NEMA). 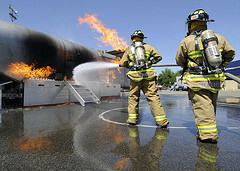 Training provides first responders, homeland security officials, emergency management officials, private and non-governmental partners, and other personnel with the knowledge, skills, and abilities needed to perform key tasks required during a specific emergency situation. The National Training Program (NTP) provides an organized approach to training for emergency managers and emergency response providers across the nation that supports the National Preparedness Guidelines. The NTP will provide policy, guidance, and tools that address training design, development, delivery, and evaluation, as appropriate. The NTP will support the development, promulgation, and regular updating, as necessary, of national voluntary consensus standards for training; and ensure that the training provided under the NTP is consistent with the standards. The Center for Domestic Preparedness (CDP) develops and delivers advanced training for emergency response providers, emergency managers, and other government officials from state, local, and tribal governments. The CDP offers more than 50 training courses at its resident campus in Anniston, Alabama focusing on incident management, mass casualty response, and emergency response to a catastrophic natural disaster or terrorist act. The Continuing Training Grants (CTG) Fact Sheet describes the key elements of the Fiscal Year Continuing Training Grants program. The CTG will help strengthen national preparedness and provide specialized training to help first responders, homeland security/emergency management officials, and citizens to prepare them for all types of disasters. The Emergency Management Institute (EMI) serves as the national focal point for the development and delivery of emergency management training to enhance the capabilities of federal, state, local, and tribal government officials, volunteer organizations, and the public and private sectors to minimize the impact of disasters. Click here to learn more about how to train for an emergency situation. Exercises enable entities to identify strengths and incorporate them within best practices to sustain and enhance existing capabilities. They also provide an objective assessment of gaps and shortfalls within plans, policies and procedures to address areas for improvement prior to a real-world incident. Exercises help clarify roles and responsibilities among different entities, improve inter-agency coordination and communications and identify needed resources and opportunities for improvement. The National Exercise Program (NEP) serves as a principal exercise mechanism for examining the preparedness and measuring the readiness of the United States across the entire homeland security enterprise. 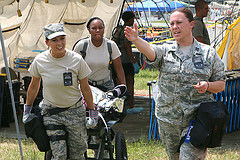 The NEP accomplishes this goal by leveraging exercises occurring throughout the United States to comprise a progressive cycle of exercises over a two-year period that rigorously tests the nation’s ability to perform specific missions and functions that prevent, protect against, respond to, recover from and mitigate all-hazards. The National Exercise and Simulation Center (NESC) is a Congressional mandated, state-of-the-art exercise center that serves as the central services hub linking planning, training, exercise and response personnel with existing modeling and simulation capabilities. The NESC’s mission is to enhance the Department of Homeland Security’s all-hazards preparedness and response mission through the promotion of effective and efficient exercise design, conduct and evaluation to include the application of modeling and simulation to these exercises. The Radiological Emergency Preparedness (REP) Program ensures the health and safety of citizens living around commercial nuclear power plants will be adequately protected in the event of a nuclear power plant accident; and informs and educates the public about radiological emergency preparedness. REP Program responsibilities encompass state, tribal and local government emergency planning and preparedness activities that take place beyond the nuclear power plant boundaries. Since 1988, FEMA and the U.S. Army have partnered to help communities surrounding the U.S. chemical weapons stockpile locations enhance their ability to respond in the unlikely event of a chemical accident or incident. The remaining stockpile sites are the Pueblo Chemical Depot in Colorado and the Blue Grass Army Depot in Kentucky. As part of this preparedness effort, depot, county, state and federal officials at each location work together every year to plan, conduct and evaluate a full-scale, chemical weapons exercise. The Chemical Stockpile Emergency Preparedness Program (CSEPP) is a partnership between FEMA and the U.S. Department of the Army that will continue to provide emergency preparedness assistance and resources to communities surrounding the Army’s chemical warfare agent stockpiles. The two remaining stockpiles are secured at the Blue Grass, KY. and Pueblo, CO., U.S. Army installations. Each community has developed its capabilities to respond to a potential chemical agent release and provides its residents important emergency preparedness information. 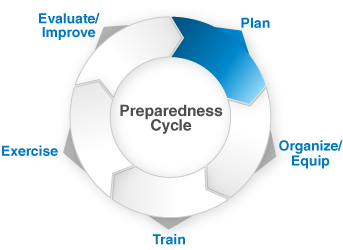 The last phase of the Preparedness Cycle is evaluation and improvement. During this phase, organizations collect lessons learned, develop improvement plans, and track corrective actions to address gaps and deficiencies identified in exercises or real-world events. FEMA’s Lessons Learned and Continuous Improvement Program (LL/CIP) brings together the collective evaluation and improvement efforts of federal, state and local emergency management and homeland security professionals to continuously improve and strengthen preparedness and homeland security at the federal, state and local levels. LLIS.gov enables emergency management and homeland security professionals to collaborate, communicate, network and share lessons learned, best practices and innovative ideas in a secure environment. Sponsored and administered by FEMA’s National Preparedness and Assessment Division (NPAD), the website is designed as a “user-driven,” interactive program that relies upon the whole community for generation and sharing of best practices and lessons learned. LLIS.gov is a free, secure online resource that provides an extensive library of valuable information resources and tools for nation-wide communication, collaboration, and sharing of innovative ideas and practices. The ability to communicate efficiently and effectively to individuals with Limited English Proficiency (LEP) is critical to the work we do at FEMA. In every disaster, FEMA staff work tirelessly to ensure that we reach out to all disaster survivors, regardless of their language proficiency.